Whether used as a live dashboard in a building foyer, for carbon-emissions reporting or to manage distributed solar production, Solid Insight brings energy and water data to the age of cloud computing. Solid Insight was born as its own entity and is now a fully developed (software and hardware) business-metering, resource-management and Internet-of-Things (IoT) application. Solid Insight is a one-stop solution for managing resource use in buildings – it connects energy and water meters and other sensors in buildings, and reliably brings consumption data to the web for use to powerful effect. The interface allows users to easily create live dashboards where data are presented in an attractive, clear and understandable format – thus allowing users to pursue sustainability goals as informed and responsible agents. 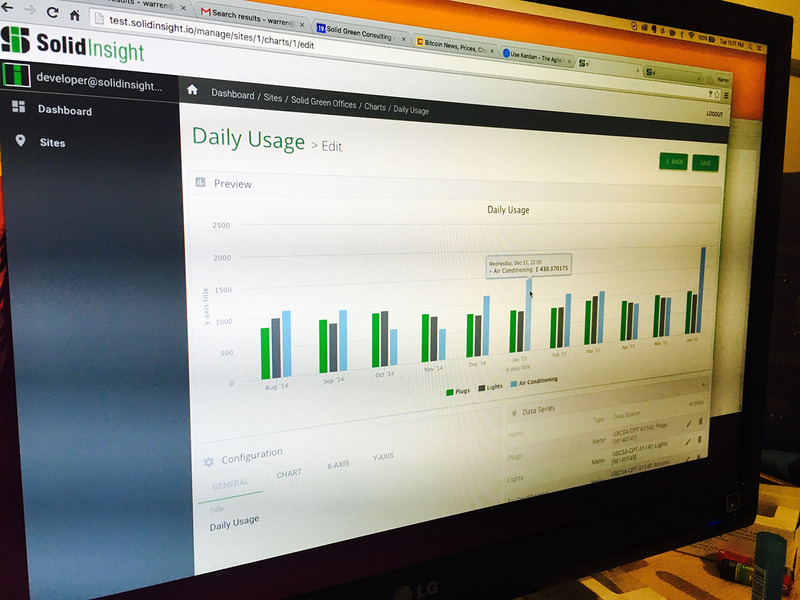 Taking the product beyond its initial scope of energy and water monitoring, many clients are now also implementing Solid Insight to manage portfolios of distributed rooftop solar investments, making use of its single, easy-to-use dashboard. The initiative has already been piloted at the GBCSA’s offices in Cape Town in 2014, and at Solid Green’s own offices in Johannesburg, which have just received the first 6-Star Green Star SA Interiors certification for a refurbishment undertaken in 2015. To find out how Solid Insight can bring your data to life, contact warren@solidinsight.co.za.